A month is hardly a unit of measurement. It can start on any day of the week and last anywhere from 28 to 31 days. Sometimes a month is four weeks long, sometimes five, sometimes six. You have to buy a new calendar with new dates every single year. It’s a strange design. 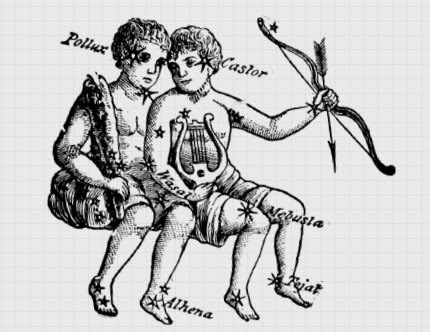 The calendar that the world uses right now is mostly a combination of the Roman lunar calendar and the Egyptian solar calendar, a product of the love affair between Caesar and Cleopatra. She was 21 and he was 52, and when they got together, they did what lovers do: discuss the true nature of the earth’s rotation. The Egyptians had already discovered that the year is roughly 365 days long because of the Nile river. 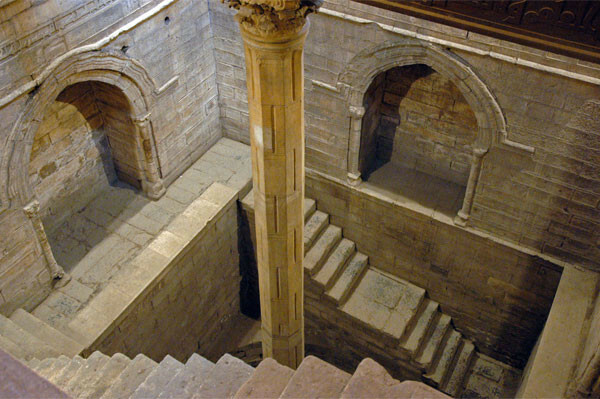 Egyptians had “Nilometers,” structures that went into the Nile that could predict the seasons, thanks to the Nile’s tendency to flood to the same height at virtually the same day every year. The Egyptians also figured out that the year isn’t always exactly 365 days, so they added an extra day every four years, just to make sure the calendar year matched up with the seasons. In other words, they invented the leap year. 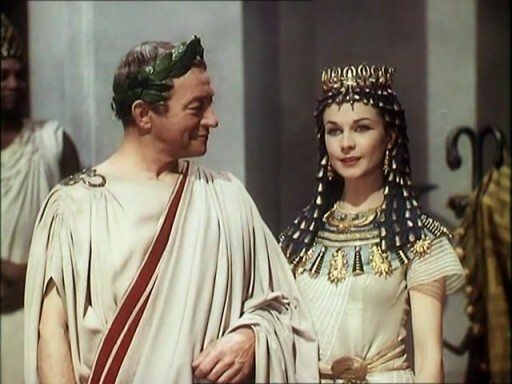 This was all fantastic news to Caesar, because he had a feeling that the Roman calendar wasn’t quite right. 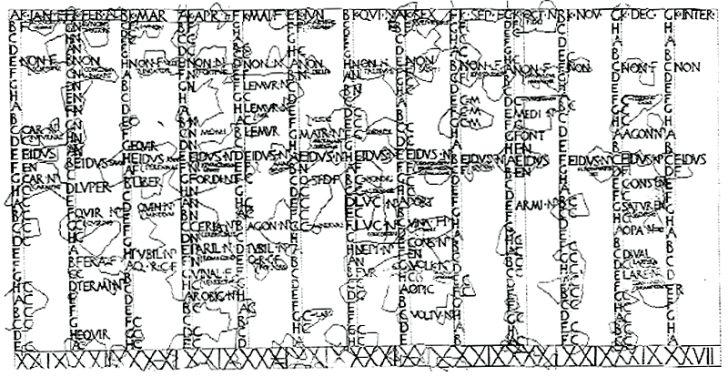 At that time, the Roman calendar year, which was based on the phases of the Moon, was only 354 days long. The Julian calendar, which added the eleven missing days and put a leap day in February, was instituted throughout the Roman empire. Still, the Julian calendar was about 11 minutes and 14 seconds off each year. These minutes added up to lost days and then an entire lost week. By 1582, Pope Gregory finally realized that everyone was worshipping all the holy days on the wrong dates from what they originally were. He made a few adjustments to realign the year with the seasons (including losing ten days), and created the Gregorian calendar, which is what’s on your wall or your phone. Now we basically live with the Gregorian calendar and don’t question it. 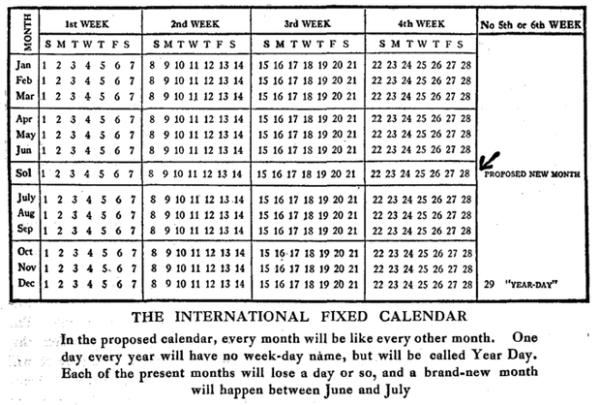 However, throughout history there have been a number of attempts to redesign the calendar. One calendar re-design came after the French Revolution; revolutionaries decreed the first year of the revolution was the year 1, and they made the week ten days long. This calendar endured for more than a decade, lasting until Napoleon crowned himself emperor. In 1849, another Frenchman, August Comte, created the so-called Positivist calendar, which reorganized the months and renamed them after great men of history (Moses, Homer, Aristotle, etc.). The positivist calendar didn’t take off. But there was another radical attempt at calendar reform that did. 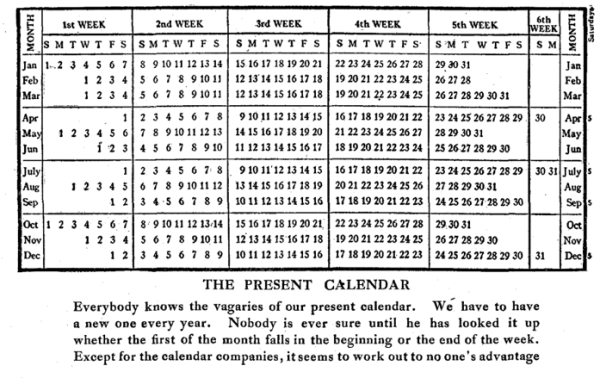 Moses B. Cotsworth worked the books books for the British railway, and the wonky, weirdly-divided Gregorian Calendar was making his job difficult. 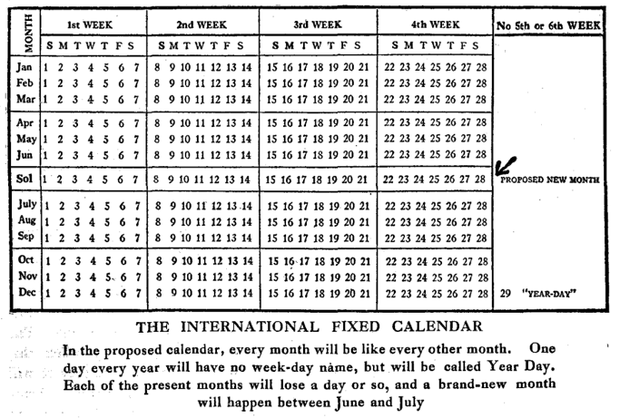 In 1902, Cotsworth presented a design for a calendar of 13 months where every month was exactly 28 days. No more, no less. Four perfect weeks. This meant the dates were all standardized as well. Regardless of the month, the 5th was a Thursday. The 1st was always a Sunday. The 10th was always a Tuesday. There would be a Friday the 13th every single month—clearly, rational railway men were not superstitious. All the month names would stay the same and an additional 28-day month would fall between June and July. This additional month would be called “Sol,” standing for the month when the summer solstice occurs. Leap Day would be added to the end of Sol, not February, so every four years, Sol would have 29 Days. 13 months of 28 days makes for 364 days in a year. 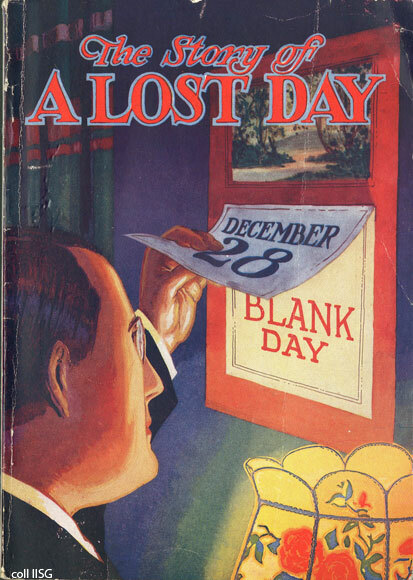 To make it 365, Cotsworth added a new holiday after December 28—”Year Day,” a floating day, not part of any month. It would be a global sabbath. Aside from year day, all other vacations would be moved to a Monday. All holidays would be three day weekends. Cotsworth toured the United States giving talks about his calendar’s myriad benefits, but he couldn’t find many takers. Though he did attract the interest of one of the wealthiest and most successful men of that time: George Eastman, the founder of Kodak. Eastman took it upon himself to promote Cotsworth’s calendar design. He started a calendar league headquarters in Rochester, in Kodak’s office. There they published and printed different flyers to hand out to local businesses and actually convinced a few local business to switch to a 13 month calendar. Including, of course, Mr. Eastman’s own company, Kodak. The Eastman Kodak company adopted the 13 month calendar in 1924 and they continued to use it until 1989. 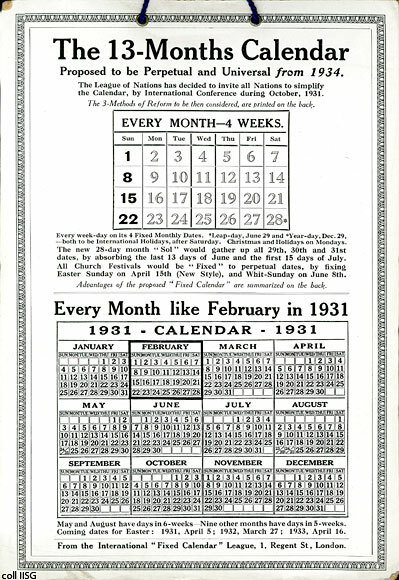 The 13 month calendar was in use for 65 years. 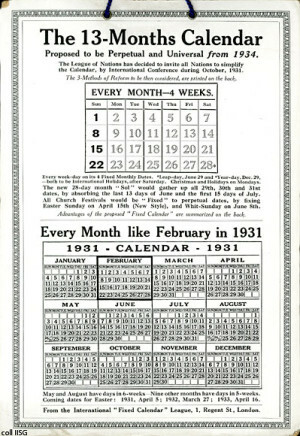 However, within Kodak, Eastman couldn’t fully institute the 13 month calendar in its truest form. 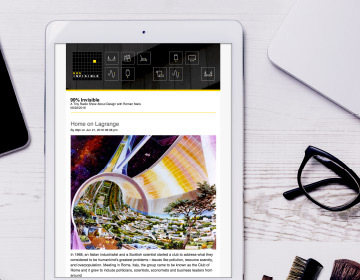 Kodak employees didn’t observe “Sol” or “Year Day” or change every holiday to a Monday. They used it like how some bankers work in quarters or some schools function in semesters- Kodak’s internal schedule was organized into 13 “periods”, labeled period 1 to period 13. They used the 13 month calendar as an organizational tool for planning finances and production schedules, but employees still lived their lives on the Gregorian calendar. George Eastman knew that if he wanted to truly standardize the calendar, Kodak couldn’t do it alone. He would have to convince the rest of the world to make the switch. 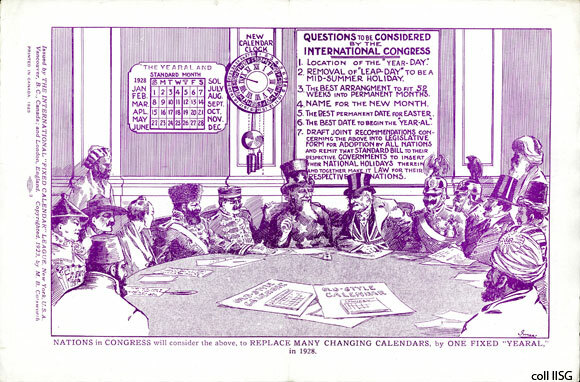 Eastman and Cotsworth presented the calendar to various committees in the U.S. Congress, and calendar reform became an actual issue of debate for the League of Nations, the precursor to the U.N. At one point The League of Nations was considering 185 different calendar redesigns, and Cotsworth and Eastman’s proposal was one of a few finalists. 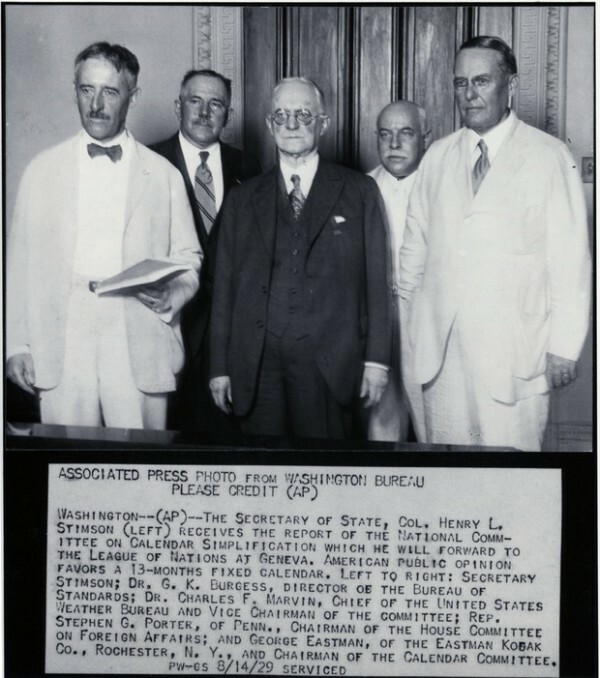 Even after Eastman passed away in 1932, the League of Nations continued discussing calendar redesign, but they couldn’t come to a consensus. And then, Hitler and World War II made the project of redesigning the calendar thoroughly unimportant. And then, the League of Nations folded. We haven’t really considered calendar reform since. But there’s no reason we can’t take our vacations in Sol and celebrate Year Day. Enjoy 99pi? Subscribe to the podcast! Producer Avery Trufelman spoke with David Ewing Duncan, author of Calendar; Mark Byrnes, who wrote about the 13 month calendar for CityLab; Kathy Connor of George Eastman House; and longtime Kodak employees John Cirocco and Robert Shanebrook (who is also the author of Making Kodak Film). I’ve got an idea for a calendar…it’s named after me: the Curtesian Calendar. Composed of twelve 28-day months and a 13th, 29-day month called “Curtuary” (Curtuary would have 30 days on a leap year). This would be perfect because having perfect 4-week months would be really easy and convenient for business and remembering on what day of the month things will happen for that year…think about it. I’m just realizing this is very similar to Kotsworth’s idea. I thought mine was original. 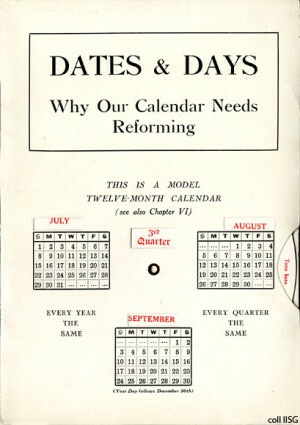 I would totally vote for Calendar Reform! except for February which is minus some. you can also use your knuckles to find out how many days a month has. start on your index or pinky knucle and mark a month for every knuckle bump and a month for every groove in between fingers. a bump is a 31 day month, a groove is a 30 day month. when you reach the end of your knuckles just go back to the first one and that will be 31 days again. Even as a Rochester native with parents, aunts, uncles, cousins etc who worked for Kodak at one point, I had NEVER heard about this before. Great episode this week! Priceless. Thanks for another great episode. The Aussie rhyme I was taught rhymes, I’m 31 and I still run through it in my head to check the days! 31 the others date excepting February 28. But in leap year we assign, February 29! Love the podcast 99, keep it up! The sarcastic throwaway line of “all the great white men of history” really added nothing to the story, as evidenced by it’s omission from this transcript. There is certainly a time and a place for race and gender as a subject in regards to design, but it’s insertion into this piece seemed unnecessary and off putting. I hope future episodes take greater consideration to such broad statements regarding race and gender. Why does she have to throw in her random 2 cents about patriarchy? It was not really the time or place for that discussion. Kind of a non sequitur. You two aren’t by any chance white males are you? If they were would that make their opinions invalid? I spent nine years designing and building calendars for a publishing company, and rebuilding them every . . . single . . . year, so this episode really spoke to me and I’ve had too much opportunity to think about this. While there are 14 possible permutations for a calendar year, there are 28 possible permutations for the structure of a month, though each month only has seven (and February has 14). Ugh! What always seemed odd was the alternating long-short pattern that is disrupted by July and August consecutively having 31 days. I figured that the alternating pattern should continue (so August would now have 30 days, September 31, etc.) and that extra day could go to February so it would have 29/30. We could even continue with leap years. But that would be too easy! Thirty days hath September, April, June and November. All the rest have 31, except February which has 28. And leap year coming once in four, always gives it one day more. I think the “28” part is intentionally meant to be a clunker, in that it doesn’t rhyme and is also the odd one out. Also “one day more” isn’t so prescriptive, but oh well. Great episode…but looking globally would have made it better. Ethiopia (and large parts of Eritrea) has used a 13 month calendar for centuries: it has twelve 30-day months, plus a 5-6 day long thirteenth month for timekeeping purposes. Hence, the great tourism tagline “13 Months of Sunshine!” The Ethiopian year begins on September 11 of the Gregorian calendar, and is seven years behind it (i.e., 2014 Gregorian = 2007 Ethiopian). Imagine the fun when you have to submit Ethiopian travel receipts to an American university for reimbursement!! I’ve spent the last 8 years following a 13 period fiscal calendar at work,and I love it. It just makes so much sense! Unfortunately we run into the same issues as Kodak, holidays move around and we have to “re-set” our year to the calendar year with a “leap week” every few years. Also, it matches up nicely with a 28 day birthcontrol cycle which is super handy. Very informative and interesting article. I work for Marriott International and until a few years ago we also worked on a 13 period calendar. One of the main advantages of the 28 day periods was having the same number of weekdays. 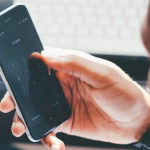 Different days have very different demand patterns at hotels and having 4 Tuesdays vs. 5 Tuesday in a month can have dramatic affects on performance. But then again you have to remember which is the short one. You cant win them all. The next step to this analysis would be to examine the way the days themselves are divided – the use of 24 hours (sometimes as 24, sometimes divided into 12 +12), 60 minutes, 60 seconds. Then there is the way we present dates in different parts of the world – Month/Day/Year; Day/Month/Year; Year/Day/Month. A leap year which makes it 29. … that’s what we were taught in grammar school; misses that February otherwise is 28 but works for me. Apropos of calendars, and your upcoming presentation, your demographic includes this 55 year old. I guess I’m that invisible part…. Also, I share Dylan’s sentiment, that the bit about “all the great white men of history.” Off putting. 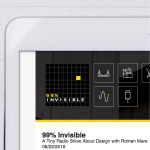 Not all of us have drunk the feminist kool-aid, and that kind of politicking seems unnecessary in a podcast about design. “loosing ten days”?? Are you sure they loosed them, and didn’t lose them? Really enjoyed this episode but could do without the political and racial BS. Thanks. all the rest have 31. When I was working as a software engineer it was customary to make a comment in code citing the governing document, usually a Military Standard, ANSI Standard, ISO standard, Internet IRC, etc. I wrote some code which had to deal with the months and computing leap year. (I must be like the 10,000th programmer to do this.) I looked and looked for an official source for this. I ended up citing Pope Gregory XIII’s 1582 papal bull “Inter Gravissimas”. It seems that the United States never officially adopted the Gregorian calendar! The constitution make several references to specific dates, but no indication is given which calendar is to be used to determine those dates. The US government has laws and standards for everything — except this. It seems that since the conversion to the Gregorian calendar had already happened when the US split away from the British empire, no formal adoption was necessary. I find this state of affairs completely amazing. Here’s something we all use every day, for all government and civil functions, but it has never been officially codified — we use the calendar we use simply by tradition and common usage. I’m perfectly happy with this situation. I’m glad that there are some areas where government regulation is apparently not necessary. If anyone knows of a US or international standard that deals with how leap year is to be computed other than “Inter Gravissimas”, I would like to hear about it. Thanks to my excellent 2nd grade teacher, Ms. Younkman. I’d like to add to the Knuckle System mentioned in an earlier comment. Make a fist with one hand, back of the hand towards you, and notice the peaks and valleys of your knuckles and the spaces in between. Starting on the knuckle of your index finger, start naming the months as you touch knuckle (January,) space (February,) knuckle (March,) space (April) etc. When you get to your 5th finger knuckle, tap it twice (that’s July and August) and come back across your hand: space (September,) knuckle (October) etc. All the months which land on peaks have 31 days, all the spaces have 30 days (or 28/29 for poor old February.) I use this every time I need to remember the number of days in a month. I enjoyed the episode, but you make it seem as if Kodak’s calendar is bizarre and unique. It’s not. I work on analytics and reporting software for business, and many of our customers – especially those in retail and manufacturing – use a 4-4-5 calendar for reporting (or 4-5-4, or 5-4-4). 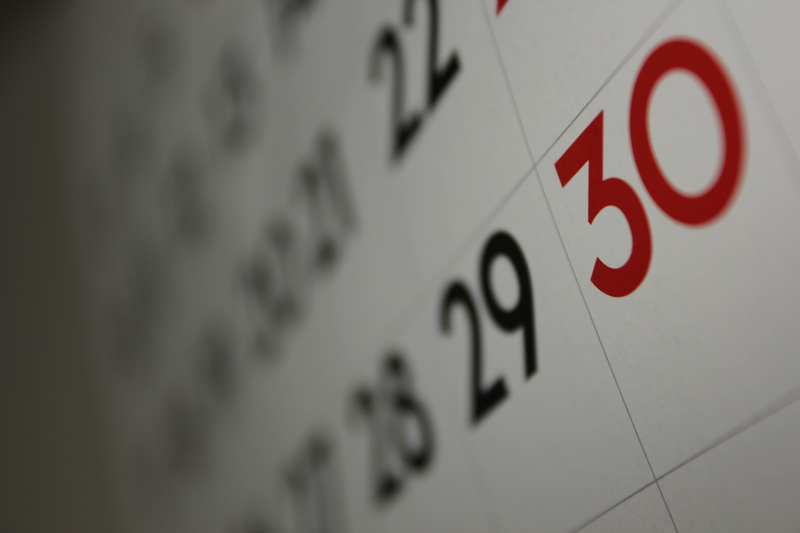 This calendar has 13-week quarters comprised of two four-week periods and a five-week period. Thus you end up with a 364-day year, and so an additional week is added every few years. I think Kodak’s “Year Day” would be a better solution, with an extra “Year Day” every leap year perhaps. Anyway, my main point is that this reporting calendar structure is not unique to Kodak nor even that uncommon. Great episode. I find calendars fascinating. Some interesting things that I felt could have been added to the episode : why do days start at midnight, when in the middle east, and in the Jewish system, days start at sundown? What about lunar calendar systems that persist? The Chinese calendar is still somewhat observed; the diaspora Chinese communities of the world still celebrate Chinese new year, which is calculated by lunar calendar. Same as the Persian New Year, the Arabic new year, the Nepali new year, etc. What’s the song in around 10 min mark?! it appears in many episodes and I have looked for it in the music credits list, and couldn’t find it. It’s only ever six weeks “long” if you have a weird definition of weeks. Also, claiming that the summer solstice would happen in the month of Sol… gee thanks, on behalf of the southern hemisphere that sounds tremendously biased. Your donations are vital to keeping us independent and strong! Update Required To play the media you will need to update your browser to a version that supports HTML5. Drag and drop to reorder. Your playlist is stored within your cookies, clearing your browser data may remove your playlist. Nothing here yet! Feel free to browse the archives to add episodes.